If you play a musical instrument it is vital that your instrument is tuned in order to have a proper sound you are after. Same goes for ukuleles. This is especially important for the new players who are not really familiar with ukulele sound and can’t really tell if the instrument is tuned or not. The most helpful gadget for this is a ukulele tuner, and here’s our selection of the best ukulele tuners on the market. Standard ukulele tuning is GCEA, where the G string is the top string if you look down from your playing position. When you first get the ukulele it will probably be out of tune unless you ask someone at the shop to tune it for you. To have your ukulele sounding properly, you will have to turn the tuning pegs quite a lot, and it won’t be easy in the beginning. Furthermore, in first few weeks your strings will stretch and you will have to tighten them and retune them every time you want to play. After 2 to 4 weeks the strings will get to the point where they stay in tune for some time and you won’t have to tune them that often. The first way is, obviously, the old school way, which is tuning by ear. You need already tuned ukulele or some other instrument for the reference tone and then you tune your uke to match the tune. Faster, easier, and more reliable way is to tune your instrument using a digital tuner. Digital tuners are generally very cheap and everyone can afford them. There are two main types of digital tuners – microphone tuners (this includes the mobile apps) and clip-on tuners. Microphone tuners use the built-in mic that registers the sound of the string you are strumming and tells you whether it’s in tune or not. Some of the more advanced microphone tuners also have a metronome or other useful features. There are also many different apps for smartphones that use your phone’s mic and act the same way as standalone microphone tuners. Clip-on tuners use piezo pickups to read the vibrations from the wood as you strum the strings. These attach to the headstock of your instrument. The clip-on tuners are much better for the noisy environment because they do not rely on the microphone. Should You Get a Tuner with a Built-In Metronome? Well, yes. Unless, of course, you already have a metronome. But if you don’t have one, you should definitely get the 2 in 1 deal. It doesn’t cost too much and it is worth the money. Metronome is one of the most useful things for practicing, so why wouldn’t you get both devices within a single gadget. Generally, the price for 2 in 1 device is double in most cases, but if you buy these two separately it will cost even more and it only takes more space in your gig bag. 2 in 1 devices are always a thumb up. Are There Any Other Types of Tuners? Yes, there are. Apart from the ones we already mentioned, there are also rack tuners, pedal tuners, and sound hole tuners. But these are not as convenient as the clip-on and microphone tuners. The rack tuners are very large and expensive and you really don’t need these for ukulele. The rack tuners are aimed towards the rack users. The pedal tuners require an electric instrument and not all ukuleles are electric. Actually, most of the players play acoustic ukuleles. The pedal tuners are for the guitar players who use pedal boards and they can add the tuner to their pedal boards for easier tuning on the stage. When it comes to sound hole tuners, these are not really convenient because they are usually optimized for acoustic guitars and if they don’t fit your instrument’s sound hole they won’t work properly. What to Consider When Buying a Tuner? With so many different models of tuners out there, there are some important factors you need to consider before purchasing your tuner. Display/meter. Many of the models use needle-based meters to show you how close you are to the pitch. Others feature LCD displays with a needle-looking graph or LED lights that usually change from red to green when you are on the right pitch. Some tuners use different colors to indicate how close you are to the correct pitch. More display segments mean easier tuning. Also, consider a larger and brighter display because you might need to tune your uke in the dimmed lighting conditions. Auto pitch detection. The advanced tuners will detect the note you are playing and show you the note’s relation to the true pitch. Less advanced ones require you to set up the target pitch for every string. Special modes. Many of the digital tuners have options for different instruments or different tunings. Some even have an option for drop tunings and open tunings. The Snark SN6 clip-on tuner is one of the most popular tuners of this type and it’s a bit more versatile than the most of the similar tuners. 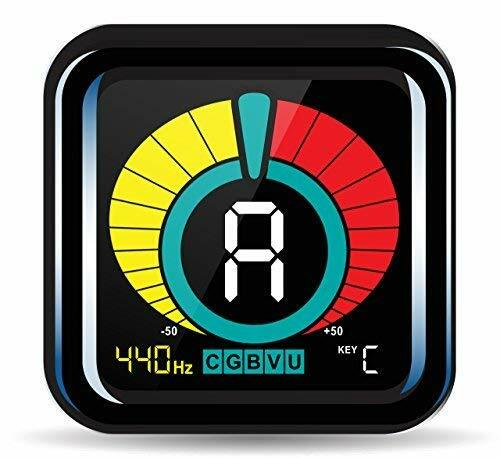 The tuner features a full-color bright display and it’s extremely easy to use. It can be fully rotated (360 degrees) meaning that you can clip it on however you want on your uke’s headstock. You will be able to see the display no matter if you are left handed or right handed. 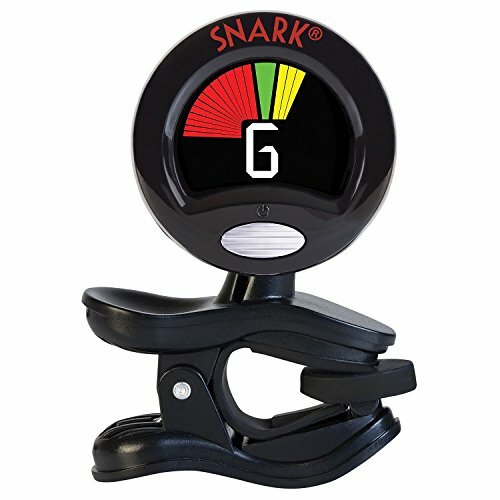 Snark has a variety of tuners with different features and some of the most expensive ones feature a built-in mic and metronome. This particular model is not really the most beautiful tuner in the world but it’s extremely easy to use and the display is extremely easy to read. Because the tuner uses the wood vibration to detect the note you are playing, it’s accurate even in the noisy environment. It’s very small and compact and it takes almost no space in your gig bag. No wonder Snark is so popular. Furthermore, this is one of the cheapest tuners you can find, yet it’s very accurate and well made. This one is a bit pricier than the Snark but it also has a super bright and quite large display. This is its most prominent feature. On the first glance it looks just like any other clip-on tuner, but when you turn it on, you’ll see the difference. It’s very bright and it also detects the played notes much quicker than most tuners. This tuner is most definitely made for quick on-stage tuning. The note and flat/sharp indicators are, of course, super easy to read and the tuner can be easily used in loud environments since it’s a clip-on tuner. The “head” of the tuner can be adjusted and set into three different positions which mean you can position the screen to be suitable for any stringed instrument, not just ukulele. The Kliq UberTuner is +/-1 cent accurate and that can be confirmed if you cross check it with some high-end rack tuner if you want. It features 5 different modes: chromatic, bass, guitar, violin, and ukulele, and it has an adjustable pitch calibration from 430 to 450 Hz. The design is very elegant and the plastic seems to be quite sturdy and durable. The tuner is also very small and it can fit in any gig bag or even pocket, which is very convenient. 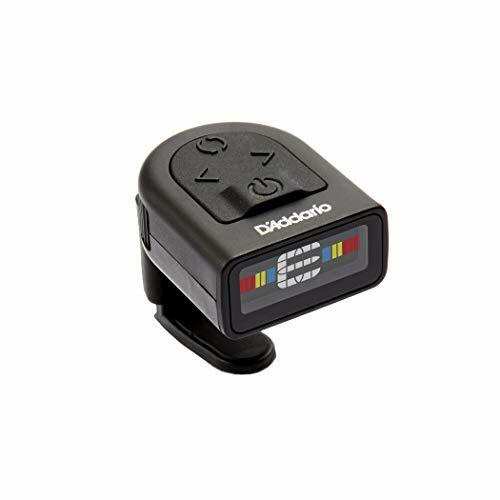 This little clip-on tuner ranks very high in terms of accuracy, speed, and convenience. It is a bit pricier tuner but it’s still affordable. The only downside we’ve found are the tiny control buttons, so it’s recommendable that you know the buttons before you get on a dark stage. 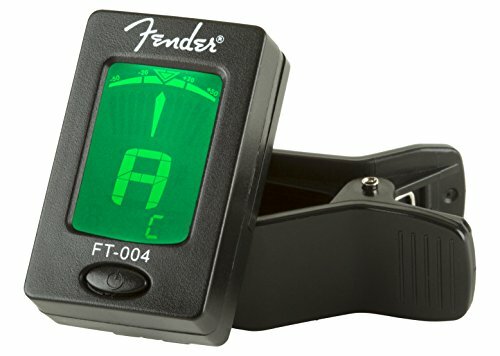 Well, when we talk about Fender, the quality is the first thing that comes to mind, and this tuner is no exception. It’s pretty basic and minimalistic but incredibly accurate and easy to use. This chromatic tuner has modes for ukulele, guitar, and violin and also general chromatic settings. The display is basic and it’s monochromatic and it’s one of the smallest displays you will find on tuners but it’s still quite easy to read. The minimalistic design goes even further with only one control button but that’s more than enough. The display shows a needle-like graph that shows you how far from the right pitch you are and it’s bright enough to use in the darkest conditions. The tuner is powered by one 3V battery that will last for a long, long time. The clamp is small and low profile but it holds very well. It’s so small that it takes less space than most of the tuners even when it’s in the box, which is very nice for the traveling musicians. It seems very durable and the price is more than affordable. The tuner allows you to manually calibrate the exact notes you need. Additionally, it has the SoundBack feature for pitch training as you tune. It detects the pitch of the sound you produce and sounds off the closest reference note. Other than cable input, this tuner also has a microphone that allows you to tune an acoustic instrument. The monochromatic display features a needle-like graph but there are also two red and one green LED lights to help you tune. When it comes to a metronome, it has a surprisingly rich set of features and functions. For example, there is a tap tempo function, as well as the minute beat adjustments. Not to mention the headphones out which is quite convenient for practicing. The display is very bright and the needle indicator is highly responsive. The device is a bit pricier but you get 2 devices in one which is very cool and practical. D’Addario is a very prominent string manufacturer and their strings are used by many famous musicians, but they managed to make a very good tuner too. It’s one of the most accurate clip-on tuners and it covers a vast variety of stringed instruments including guitar, ukulele, bass, mandolin, etc. This nifty little tuner is very small and compact, yet very durable and quite easy to use. It’s also very discrete and you can have it on your instrument at all times and no one will notice because the display goes on the back side of the headstock. You can put it anywhere on your headstock thanks to the adjustable ratchet mechanism and a reversible screen. 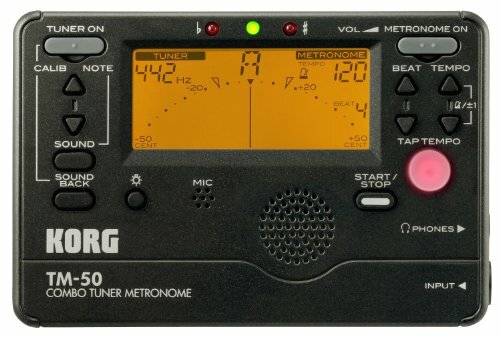 This tuner also features a visual metronome which is a very useful feature for both beginners and professionals. Controls are conveniently placed on the top of the tuner and are quite easy to use. In our opinion, the best tuners for the ukulele are the clip-on tuners, and the best clip-on tuner is most definitely the D’Addario NS Micro Tuner. This tuner has everything you need from a tuner. It’s very accurate, it’s easy to use, and it has a visual metronome. The nicest thing about it is how discreet and unnoticeable it is. No one can see it from the audience which is very cool. Furthermore, the price is more than affordable which is very important. Every tuner on our list does its job very well, but the D’Addario NS Micro is the most valuable one we found.